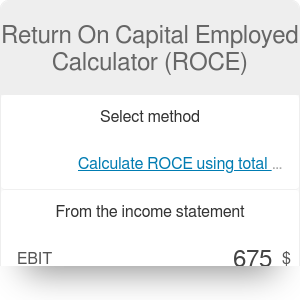 Return on employed capital calculator is a tool which helps you calculate ROCE - one of the indicators used in business. It informs us about how efficient is the company in generating profit from its fixed capital. If you want to know more about it, keep reading! In this short article, we will provide you with some information about ROCE itself, the importance of return on capital employed, and - obviously - find an answer to the question: how do you calculate return on capital employed? Return on employed capital or, more strictly, return on capital employed (ROCE) is a ratio which informs us about the profitability of investments in which the fixed capital of the company is engaged. Thanks to it, we can measure how efficient is the company and compare it with others. The situation when the cost of capital is higher than ROCE means that the company operates inefficiently and is not valuable for shareholders. As we have already explained what is return on employed capital, we can go to the next step. Perhaps you ask: Oh, right, then how do you calculate return on capital employed? Don't worry, we will make it clear. We have already discussed a few business indicators and, to be honest, each of them should be deemed important. Actually, none of them has been created without a reason. So... what is the importance of return on capital employed? ROCE is an important ratio because, as opposed to ROE which considers only equity, it analyses the whole capital of the company. It's useful especially in companies which belong to capital-intensive sectors, such as utilities or telecommunication, as it makes it possible and more effective to analyze the activity of companies with a significant level of debt. Return On Employed Capital Calculator can be embedded on your website to enrich the content you wrote and make it easier for your visitors to understand your message.